Loopy's isn't a bar; it's a complex. With volleyball leagues and bean bag tourneys overlooking the river (along with a tiki rum bar and fire pit), Loopy's also has a heated dome for indoor leagues. They have tube, kayak, and canoe rentals plus pool and dart leagues. People hit the dance floor on weekends and DJ karaoke on Saturdays. Happy hour is weekdays 3-6pm with a host of taps and specialties. Some free food on Packer game days. Named Best Bar for Outdoor Games seven years in a row by V1 readers. 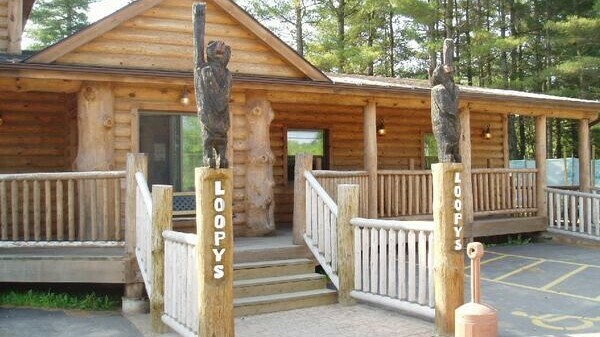 A log cabin atmosphere sets the stage for casual eating at Loopy’s. Located right on the Chippewa River, the fish fry and homemade pizza are popular menu items, but make sure to check out the terrific nachos. Philly beef pepper jack sandwiches and homemade soups are a favorite. Weekday lunch buffet, outdoor seating, outdoor private party area, banquet services, and vegetarian friendly. Loopy's is also a venue for weddings and receptions. Offers a shuttle to and from Loopy's to your home or hotel within 15 miles. Tubing, canoeing, and kayaking available seasonally (memorialy day to labor day.) Open until 11pm in the summer. Volleyball leagues, jenga, bags, and more games. Loopy's has a lot going for it. I really enjoy the outdoor tiki bar and dome in the winter time. There is always a lot going on. The food is good, and the boody marys, but the beer selection is pretty poor. It is a great place to stop when tubing on the Chippewa river. I would bring a lock and chain for your coolers and such, because ours were stolen last week. Not really Loopy's fault, but just an FYI. We always have a good time at Loopy's. Always a good time at Loopy's. Good food, great service, and lots of entertainment options.